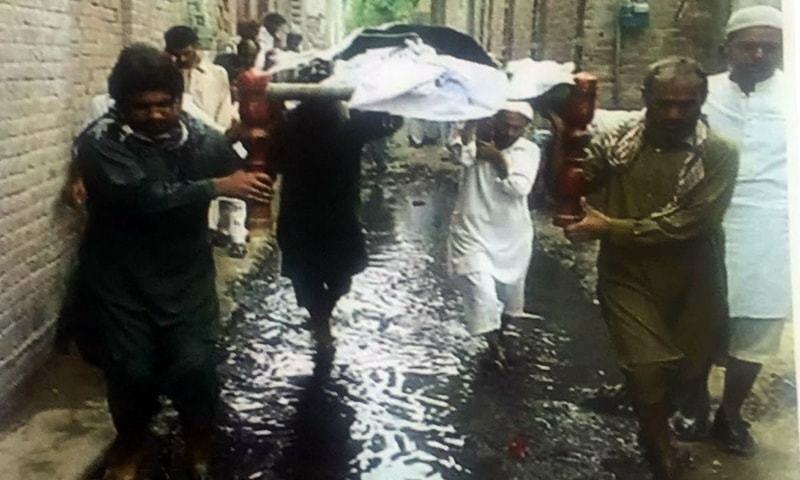 Chief Justice of Pakistan (CJP) Mian Saqib Nisar on Tuesday took suo motu notice of a picture circulating on social media that showed a funeral procession passing through sewage water. During the hearing of a case, the CJP directed the attention of the attorney general and advocate general towards the photo. "People are walking to offer funeral prayers and they have been left impure [due to walking through the unsanitary water]," Justice Nisar observed. Asking which city the scene captured in the photo belonged to, the CJP directed media representatives to also look at the photo and point out the area it originated from. "This filth is a threat to human health and cleanliness," he remarked. 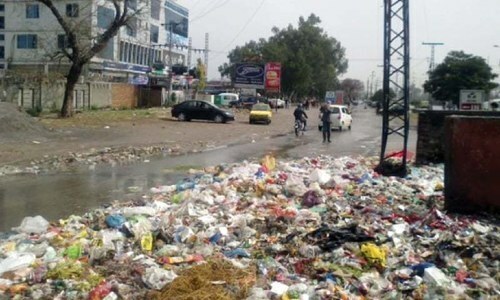 "We will take the MNA, councillor and other officials of whatever area is depicted in the photo to task [over the unsanitary conditions]," Justice Nisar said. The apex court, under its 2018 agenda, is focusing on human rights issues, particularly those relating to the people’s right to quality education and healthcare. However, this course of action is also being seen as an overstepping of boundaries, similar to the Iftikhar Chaudhry era. The chief justice has stood by the court's actions, reiterating that such criticism will not deter him from exercising what he considers is his "constitutional right." MNA's and MPA's are busy making money, they least bother what is going in their areas. We got thousands of such locations in th country...Who will tak care ? @Amir exactly and i am sure they will elect same people and chairs will be revolving around PPP/PMLN forever. We deserve these leaders. The famous saying is that "A Nation gets the leaders it deserves". Thanks to our appointed and mostly uneducated MNAs and MPAs who are also making sure that their constituents remain uneducated and voice less that we get these so called leaders rather then those who are supposed to server their people. Unless we pay attention to social sectors specially education, health, safe dwelling including safe drinking water nothing will change. Most of the so called appointees (leaders) are busy making money for themselves. Who cares about the voiceless people. democracy is the best revenge !! anyone remember that. Well this photo is just a reflection of that revenge and there are thousands and thousands of such images rampant in every part of the country since last many years !! Should we rejoice that someone has taken a notice or repent on the fact that its too late to take notice off as the person who lived in that street is already dead !! chief justice zinda bad. such chief justice come once in 1000 years. The history will remember him in golden words. CJ's actions are commendable. Such steps would raise awareness among the public about the value of their vote and shake the conscience of so called leaders who are least bothered about the problems of a common man. The money leaving the treasury for inner city/ town roads and sanitation etc projects is sufficient to complete the projects to the standard of developed countries but being squandered and looted through mismanagent and corrupton. SC has little option than to interfere when the govt has failed to provide basic amenities to the public. @Ataullah khan He's truly humble and understands the feelings and the problems faced by a common man. Its too embarrassing for us , there is no human values exist here . Water and sewerage board should take an action I believe all over Pakistan same problem exist regarding sewerage . @Ataullah khan I endorsed your views 1000 times. "The apex court, under its 2018 agenda, is focusing on human rights issues, particularly those relating to the people’s right to quality education and healthcare. 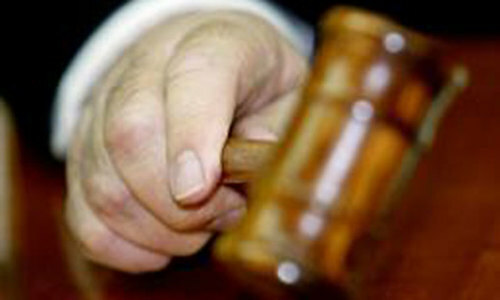 However, this course of action is also being seen as an overstepping of boundaries, similar to the Iftikhar Chaudhry era". The apex court's 2018 agenda is highly commendable in that while it is the people of a country who matter & it is people’s constitutional right to quality education and healthcare successive governments have chosen to ignore this fundamental right of the people. In this scenario, intervention by the courts is the only way to force the errant governments to set their priorities right. No country can survive without healthy& educated people. CJ sahab, according to Rana Sana Ullah, for last 10 years you have been interfering in their '' good governance '' so much that they could not even provide basic necessities to public. Your decisions have been stopping them from doing their work. Works like Providing Ambulances in timely manner whenever it's need. Providing clean drinking water to people who don't have wells in their homes. Providing designated vehicles and garbage bins to make sure people have garbage free streets and roads. and so many other issues are created and continued for last 10 years due to your one decision taken in July 2017. And when the CJP retires; it will be business as usual. The corrupt unfortunately never retire. I am glad that Saqib Nisar is amongst the few doctors rescusitating the country which is on life support. Singapore has 7% sales tax and they have surplus budget. We have 17% Sales Tax and no one knows where the money goes. Politicians need to be questioned about corruption openly at every level whenever they come in Public. Let us compliment the CJP for taking the issue up. I strongly request the CJ not to suggest or observe or take notice ........ but to actually DO something about these things. Hats off to you sir. Alas, you are forced to do others' job. The court maybe overstepping its boundaries but we have no other option. @rich : CJP is not talking about the dead person in picture. He means those who are carrying the funeral has to offer funeral prayers. One can not offer a prayer in impure condition. Unfortunately, they [the people in picture] has no way left. Well done CJP. Thanks. Pakistani nation is proud of you. CJP should make the MNA, MPA and CM walk in sewage water. @Voice of Public: Rana Sana-ullah can never be trusted. The man is a disaster for Pakistan. CJP - this can be anywhere in Pakistan. From Karachi to Khunjerab. MNA & PMA are as bad as their political leaders Sir. Pls also take these leaders to task as they rule the party. Half of the country is like this. should we consider this a threat to half of the parliament & local bodies. @Arshad 50% of the tax money of Rs3.5 trillion goes into the VIP culture of our ruling class for maintaining their standards and show off.The rest is siphoned out by these leaders.Then we borrow the similar amount of around Rs 4 trillion every year and pay salaries,interest and loan instalmentas and what left for development,May be Rs 1 trillion and 80%of the same is again siphoned out by our rulers. Chief Justice Sahab it is not a petty issue,you have take a very bold bold decision and send the top 10000 corrupts of this country to jail and recover the looted money.For the rest corrupt nation will take care of them. Gentlemen..Remember a quote by Zardari" Jamhuriat Bahtareen Intiqam Hai"
@WM When SC will send these elected officials who get funds, to jail, only then we can see some improvements, btw these public officials are always after free money. A very pathetic and disgusting. The image depicted in the photo indicate that conditions not to be new but prevalent since long time. Basically the community is at fault for using this street with choked drains and overflowing foul water without lodging any protest to these unsanitary environments. It is correct that municipal authorities should be alert and take remedial measures but the fact is that it never happens. One has to look at Karachi, producing 35% of the wealth of the country and still having tons together of garbage litters on the streets, mismanaged hospital wastes dumping, untreated industrial waste discharged into water bodies and above all unpotable water supplied to people for their daily use. Similarly, Lahore's drinking water is laden with arsenic, which requires special membrane filters to get rid off. Unless people do not wake up and create consumer monitoring groups advocating clean living conditions in their communities, these adhoc solutions would not work. The extra ordinary spendings on VIP cultures beared by government must be curtailed and diverted to improve civic and sanitation facilities. This is certainly outrageous and shameful. At once instance we saw a political leader stepping foot on red carpet after emerging from helicopter, while a holy procedures like this being carried out on a sewerage stalled water. 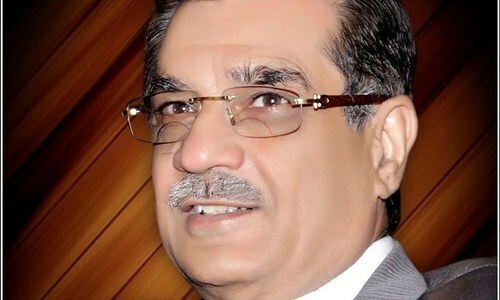 CJP has rightly taken the notice, and we must appreciate him. On the other hand the people themselves must awake, spare some time on Sundays examine their 'street' issues and fix at their own effort,forget the municipal staff they will not do. Besides to streamline self help, the people must voluntarily appoint a person as 'Street Director' amongst themselves,to look at street issues. This picture is the picture of every small city or village in Punjab, especially the south Punjab. How many MNAs or MPAs the Supreme Court will call. Mr. CJP. I appreciate your concern but how many MNAs, MPAs and councilors are you going to pursue. The issue is of educating the people to certain rights and obligations. It should be their right to live in a clean, sanitary and echo friendly environment. It is their obligation to make every effort to maintain these standards. However they willfully contribute to polluting, encroaching, deforestation and dumping of waste which has untoward consequences besides just the cosmetic. To prove my point, they have never held their elected leaders accountable and thrive on this filth. They are destined to be immersed and ruled by this garbage. Mr. CJP please understand the reality and do not get embroiled on these peripheral issues. Establish a legal system that is transparent, just and efficient. That could be your legacy! @Amir who should people vote for then? who is eligible to get votes here? Development funds should be taken away from MNAs and MPAs and the local councils should be given responsibility and fundings to carry out such tasks. Kindly compare the defense budgets as well and you might get an answer. They only spend 3-4%. The photo is not taken by author but anyway thank you for highlighting it , much needed . Justice Nisar and his team will go down in history of Pakistan where Pakistan judicial system took the first big step anti corruption drive a defining moment for my Pakistan progressive future.